Compare pillow brands Pillow Talk, Adairs, Dunlopillo, Sheridan, ALDI, Bambillo, IKEA, Kmart, Target and Tontine on comfort, durability, ease of cleaning, value for money and overall satisfaction with our 2018 review & ratings. For the second year in a row, Pillow Talk has proved ‘head and shoulders’ above the rest, scoring five stars from consumers on comfort, value for money and overall customer satisfaction in our 2018 pillows review. There are plenty of factors that can affect the quality of your sleep – the mattress, the weather or even the kids – but your pillow can also play a big role. A well-designed pillow provides the right foundation for a good night’s sleep, helping to relive any unsettled neck and shoulder tension. While it might seem like a small part of the whole sleep equation, the right pillow can help you to wake up fresh and ready to go for the big day ahead. 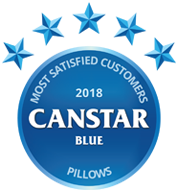 Taking the time to choose the right pillow for your sleeping habits and needs is essential – to help, Canstar Blue has produced a review of pillow brands in Australia. We’ve surveyed more than 1,400 adults across Australia, asking for their opinions on the pillow they’ve most recently bought and used. We asked respondents to rate their pillow based on a number of crucial factors, including comfort, durability, how easy it is to clean, whether it represents good value, as well as their overall satisfaction with the pillow. 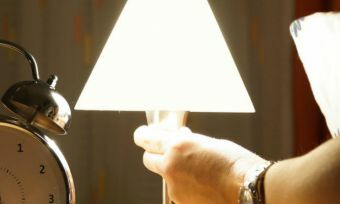 Ten different brands received the minimum sample size to be included in the star ratings table you see above, with Pillow Talk the only brand to receive five stars for overall customer satisfaction. Dunlopillo was the only brand to receive five stars for durability, as well as ease of cleaning. Kmart Homemaker was the only brand to match Pillow Talk in regards to value for money. Only Adairs, Dunlopillo and Sheridan scored four stars overall, with the remaining six brands all scoring three stars. Survey respondents spent an average of almost $40 on their new pillow, suggesting that many are keen to take a relatively cheap option. 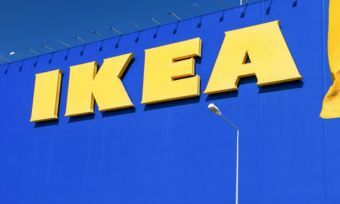 Interestingly though, the brands that are home to the cheapest pillows around – Target, Kmart, IKEA and ALDI – all earned just three stars overall. So perhaps it pays to spend a little extra on a quality pillow. To help you decide, read on for details about the 10 brands in this year’s review. Established in 1977, Pillow Talk is Australian-owned and operated. Unsurprisingly given the name, Pillow Talk sells a huge range of pillows including both its own lines and other leading brands. Purchases can be made online or in person at one of 59 stores around the country. Pillow Talk’s pillows are branded under a few different names, including Essentials, Pillow Talk Naturals and Gentle Dreams, just to name a few. The Pillow Talk range covers various sizes – standard, junior, king, queen, V-shaped, European and body pillows. Pillows in the ‘Naturals’ range have a 30% down, 70% feather filling inside a cotton cover, while the cheapest basic types are mostly polyester fill inside a soft polyester cover. 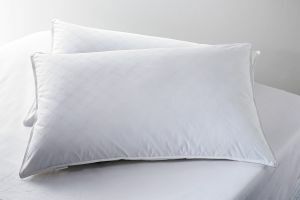 There are also pure duck feather fill pillows and polypropylene-covered pillows. Prices start from $7.95 for the baby range and go up to around $300 for Pillow Talk’s ‘Superior White Goose Down Pillow’. 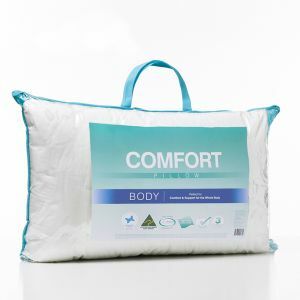 Adairs produces its own pillows under the Adairs Comfort and Downtime lines, as well as several pillows under South Australian brand MiniJumbuk. Adairs Comfort is an everyday pillow range, while Downtime offers premium products. MiniJumbuk offers premium wool bedding including wool pillows containing a blend of 60% Australian wool and 40% manmade fibres. Adairs pillows tend to come at a mid-to-high price range, with more of a focus on premium products. The product range covers the full size and fill spectrum, with standard, king European, U-shape and body pillows, filled with synthetic fibre, goose feather, wool, natural latex or memory foam. 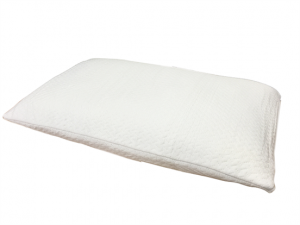 Adairs’ Comfort Memory Foam Pillow uses shredded Memory Foam with a removable bamboo blend cover for apparent easy washing. While you can find Adairs pillows for less than $30, most of its range sits between $50 and $100. You can find the Adairs ‘Comfort Low & Soft Standard’ pillow from around $30 and its Downtime Ultimate Siberian Good Down pillow from close to $300. One of the world’s most famous brands of pillow, Dunlopillo produces high-end latex and memory foam pillows. It seems to focus on its premium ranges, with latex products usually costing between $140 and $320, and memory foam pillows starting from $100 and maxing out at $360. The open-cell structure of its latex pillows is boasted for superior ventilation, and for those who find memory foam too warm, its range uses a Therapillo Cooling Gel for its cooling properties. 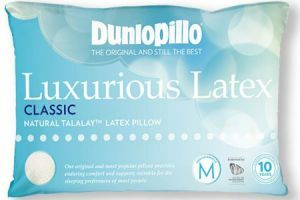 Dunlopillo latex products are guaranteed for 10 years and are made with Talalay latex, which breathes well and is said to naturally resist bacteria, mould and dust mites. The Dunlopillo memory foam pillow line, called Therapillo, has been endorsed by the Australian Physiotherapy Association of Australia. They are also guaranteed for 10 years against ‘faulty workmanship and materials’. The memory foam moulds to the shape of your head and neck for correct spinal alignment and relieved joint pressure. Probably one of Australia’s most recognisable luxury linen brands, Sheridan’s pillows include polyester, goose feather, memory foam and combination latex/feather and down fills. The line also features a kids’ pillow, which is hypoallergenic and has a low, soft profile that’s claimed to better suit the smaller frames of young people. 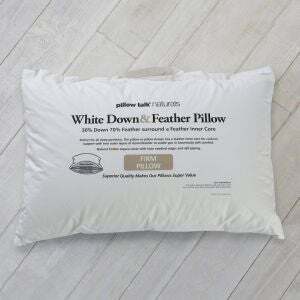 Another unique pillow in the Sheridan range is the Deluxe Feather & Down latex pillow, which has a Talalay latex core for support with a goose down layer of 85% down and 15% feather. Some pillows come in multiple sizes, including European and king sizes, and a choice of medium or firm fill. Sheridan’s kids’ pillow costs around $45, while the standard sized range starts from closer to $70 for the Ultralux Pillow. Sheridan’s pillows at the high-end price range, including its Deluxe Feather & Down Pillow, cost between $280 and $320 depending on size. ALDI is a well-known brand for its ‘Special Buys’ that are released every week, to try and get your hands on before they’re all gone. One of its exclusive offers includes a range of pillows that tends to come out just once a year. The ALDI pillows are claimed to be designed for maximum support and comfort. ALDI’s most notable types are an assortment of memory foam pillows, down like and latex pillows. It offers three support levels – soft medium or firm. ALDI also featured a V-shape, memory foam pillow, coming in with four different colour variations. It’s stated to respond to movement and continuously reset for ultimate relaxation. The memory foam range tends to cost around $30, while its latex pillows will likely set you back about $35. Its Ultra-fresh health pillow was priced as low as $9.99, being designed with a cotton japara cover and piped edges and gusset for neck support. It’s also said to use an ‘antibacterial fibre’ that aims to reduce the growth of bacteria. While it’s easy to miss out on ALDI’s limited edition ranges, keeping an eye on its catalogue will help you prepare for when ALDI pillows are back in store. Bambillo produces just the one pillow, but it’s claimed to function as eight pillows in one! The Bambillo pillow is filled with memory foam that can be adjusted into the right shape for your specific sleep needs. Memory foam is temperature sensitive – it softens when in contact with the body, thus cradling your pressure points and remaining firm around them. It is also said to breathe well, to keep sleepers from getting too hot. The Bambillo pillow includes an anti-microbial treatment for prolonged freshness. Other benefits that Bambillo boasts about its pillow are neck support in its natural alignment, and ease of airflow and blood-flow to decrease snoring. Additionally, it’s claimed to release nerve pressure while sleeping. It comes in a queen size (76x48cm) and can be hand-washed. True to form, IKEA’s pillow range covers the budget end of the spectrum, right through to high quality and higher price tags. Most come in a choice of softer or firmer fill. Fills available include polyester, duck down and feather (from ratios of 10/90 to 60/40) and memory foam. The fabrics used in the pillow casing vary from polypropylene, cotton and polyester/cotton blend to the wadded quilting and ‘sateen-woven’ cotton varieties. 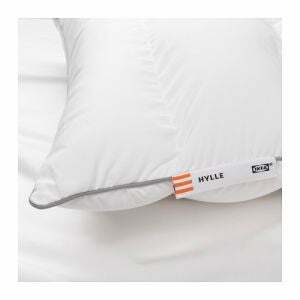 Some pillows use moisture-wicking lyocell in the casing, a renewable material made out of wood. IKEA’s ‘Slån’ pillow costs as little as $2.49 and while it might be a fairly simple polyester pillow, it’s stated to be ideal for those who like to sleep on softer pillows. 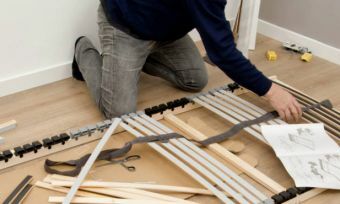 There are a few other options that are all priced under $10, so for a budget friendly option, IKEA may have you covered. Its most expensive pillow is the ‘Knavel’, which uses 90% duck down and 10% small duck feathers for the outer filling, along with 60% duck down and 40% duck features for the centre filling. It ranges in price from $79 to $99 depending on the feel you’re after – the more filling the higher the price. Starting from just a few dollars each, Kmart produces cheap pillows for the whole family. The range includes low profile (for tummy sleepers), medium profile (for back sleepers) and high profile (for side sleepers) pillows in standard sizes, plus anti-microbial kids pillows, European (square) pillows, U-shaped pillows and body pillows. Fills include the usual polyester, feather and down-feel microfibre. There are two types of memory foam pillows available – either shredded foam fill with a bamboo blend cover, or a contoured foam pillow with a removable zipped pillowcase. 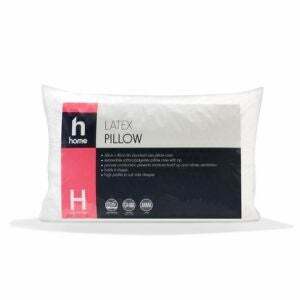 Kmart also produces a pincore latex pillow and a cooling gel-panelled polyster pillow. Prices range between $5 and $29, with its Kids Pillow coming in at $7. At the ‘high price’ end of Kmart Homemaker pillows you’ll find the Memory Foam Contour Pillow (medium profile) for $25 and the Latex Pillow (high profile) for $29. Both feature a removable pillowcase with a zip for apparent easy cleaning. Target produces a range of cheap pillows for different sleeping needs, including tummy sleepers, back sleepers, side and back sleepers, and allergy sufferers. Filling types available are polyester, polyester treated to feel like down, memory foam, duck feather core surrounded with a layer of down, as well as Pincore Talalay latex. The range includes a body pillow and two shapes of latex pillows – a contour shape for back sleepers and a regular shaped pillow for side sleepers. Additionally, Target offers two types of pregnancy sleeping pillows for support. You can score one of Target’s pillows from $3 in a pack of two, with prices maxing out at $59. 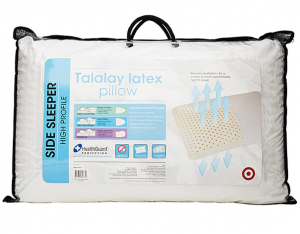 Target’s ‘high-end’ pillows use Talalay latex for extra support that is said to allow for greater ventilation. These also feature ‘Healthguard’ protection that is claimed to have anti-microbial, anti-bacterial and anti-dust mite properties. For a luxurious feel, the Target Down Surround Pillow is also offered at the same price of $59 and is boasted to suit all sleepers with its medium support and high loft. Have you ever wondered why Australians refer to duvets as ‘doonas’? Well, it’s a trademark of Tontine, an Australian bedding company. 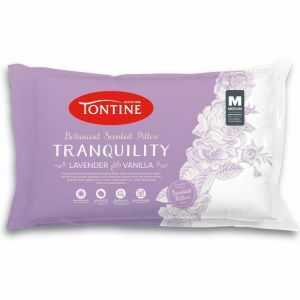 Tontine claims that over 80% of its products are Australian made, with a product range that covers the full spectrum, from value up through to luxury bedding. Tontine pillows come in a range of combinations of low to high profiles and soft to firm feels in anti-bacterial polyester or microfiber fills, plus several types of memory foam, latex and down-like pillows. The full Tontine line is priced under $60. There are a number of different Tontine pillows designed specifically for kids, such as first pillows for children moving from cot to bed. These sit around $20 to $35 in price. All Tontine children’s pillows are antimicrobial treated and endorsed by the National Asthma Council. For a unique sleeping experience, Tontine also offers scented pillows in a variety of aromas, from lavender vanilla to botanical Aloe Vera. This range is available from around $20. 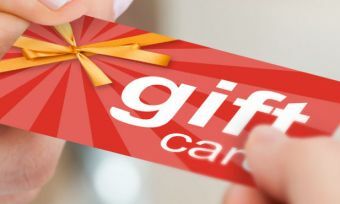 Canstar Blue surveyed 3,000 Australian adults across a range of categories to measure and track customer satisfaction. Data was collected use Qualtrics’ online sample aggregation from ISO accredited panels. The outcomes reported are the results from customers within the survey group who have purchased and used a new pillow in the last two years – in this case, 1,424 people. 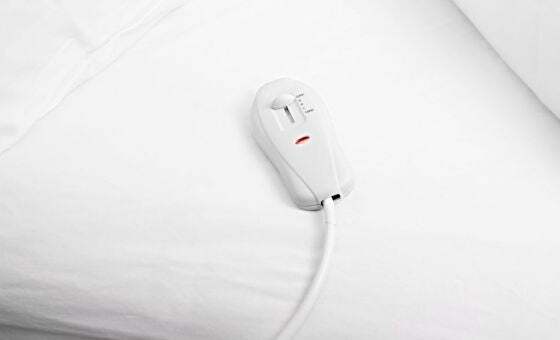 When winter comes calling, it’s time to get out the electric blanket. But which brand is best and where can you find the cheapest deals? Read our review.